Documentarian Thomas Riedelsheimer shows us Andy Goldsworthy as he creates art in natural settings using natural materials such as driftwood, ice, mud, leaves, and stones. 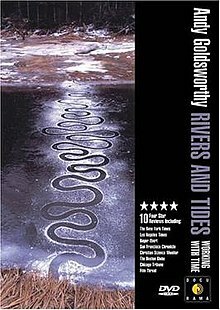 Goldsworthy comments on his "earthworks" and occasionally responds to off screen questions from Riedelsheimer while he painstakingly builds his outdoors sculptures. With some exceptions, such as a winding stone wall that he built in Mountainville, NY, Goldsworthy's creations are intentionally mutable works. We see how several of them fall apart, melt, or drift away due to exposure to the elements; we also see, for example, a complex structure of interconnected sticks collapse while Goldsworthy is still working on it. Riedelsheimer takes us to Goldsworthy's home in Penport, Scotland, and to a French museum, but the emphasis of the film is on observing Goldsworthy at work.